The headline deals of £30 billion contracts signed between UK and China during the state visit of Chinese President Xi Jinping and his large business delegation in October are unprecedented in its scale. The sectors and regions across the UK involved are so wide ranging and projects so high profile that it feels that this may be a sign of long waited floodgate moment. Further deals have already come quick and fast since October. From ABP’s £1.7 bn London Royal Dock development in Newham to the NNL/CGN’s investment in the £24 bn Hinckley Point power station; from Beijing Construction Engineering Group (BCEG) £130 m to finance the ‘China Cluster’ in Manchester’s Airport City to the SinoForturen’s £2 bn investment in UK’s Orthios Eco Parks at Holyhead and Port Talbot. Two Chinese airlines have announced direct flights to Manchester since the visit, and in December, Chinese company CMC has agreed to invest $400 m in Manchester City Football Club. No wonder that both Britain and China declare now as the beginning of a golden era in the bilateral relationship. Guangdong is the biggest Chinese domestic regional market with 104 m population, one tenth of China’s GDP and a quarter of China import and export. 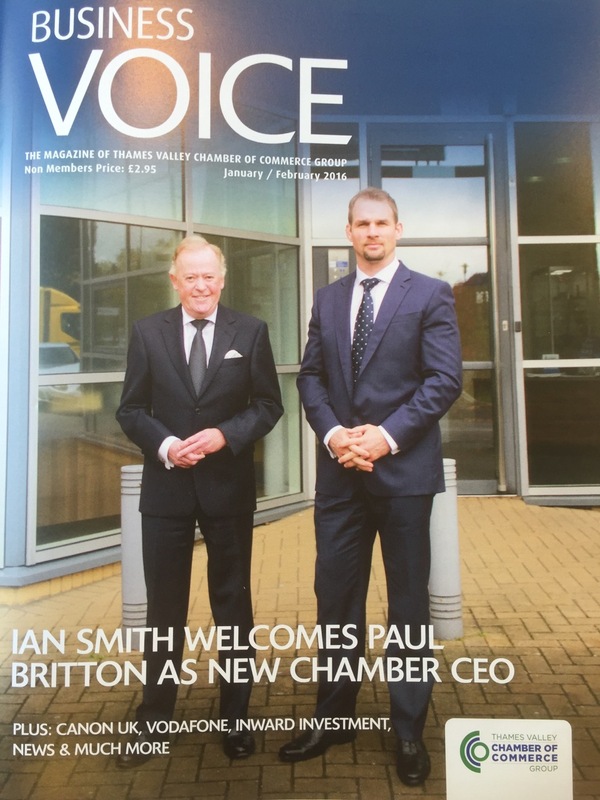 Closer partnership between BCC LinkToChina programme with the Guangdong Province in the last few years has led to the agreement for the Guangdong Economic & Trade Office to be co-located with LinkToChina in the Thames Valley Chamber of Commerce in late 2014. During the year of 2015, Guangdong government and businesses are warming up to the opportunities in London – Thames Valley market which has received an increasing number of Guangdong delegations from the Provinces and the cities of Guangzhou, Zhuhai, Shenzhen, Foshan, Chaozhou and Shaoguan. The Chairman of Guangdong Province chamber CCPIT Guangdong, Mr Chen Qiuyan, led a group of senior chamber officials to visit the UK in October, were in Thames Valley Berkshire and held talks with key partners to Guangdong. Mr Chen were impressed by what Thames Valley have to offer as a location for Guangdong investors and emphasised the province willingness to work with the Thames Valley in increasing the awareness about Thames Valley in Guangdong. On 19 October, a business delegation from the City of Foshan worked with Bracknell Forest Council to stage a seminar in Bracknell which was attended by over 40 local participants. 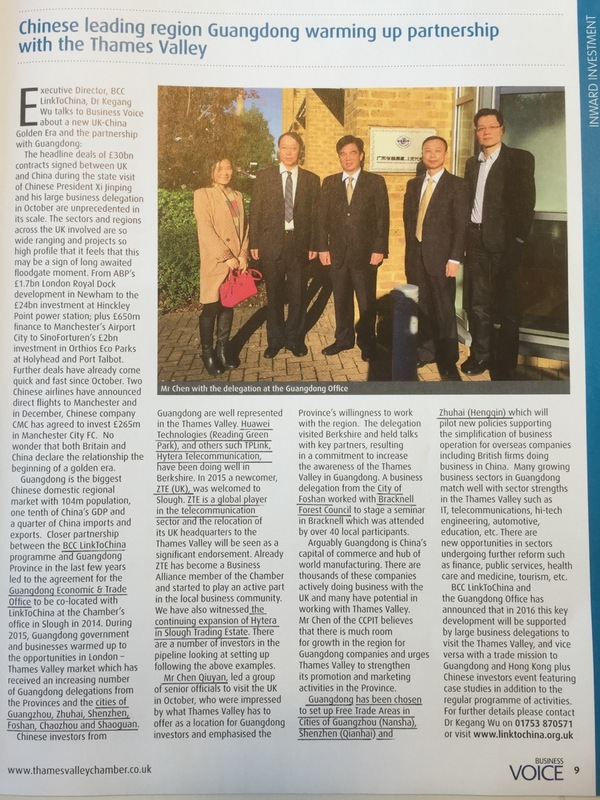 Chinese investors from Guangdong are well represented in the Thames Valley. The largest Chinese investors, Huawei Technologies (Reading Green Park), and others such as TPLink, Hytera Telecommunication UK Ltd have been doing well in Berkshire as well as those in London like Ping An Insurance and China Merchants Bank. In 2015 we welcome a new comer in ZTE (UK) Ltd to Slough. ZTE is a global player in telecommunication sector and the relocation of its UK headquarters to the Thames Valley region will be seen as a significance endorsement to Thames Valley as the ‘Silicon Valley’ in UK. Already ZTE has become a Chamber’s Business Alliance member and started to play an active part in the local business community. We have also witnessed the continuing expansion of Hytera in Segro’s Slough Trading Estate. There are a number of investors in the pipeline looking at setting up shops following the above examples. Arguably Guangdong is China’s capital of commerce and hub of the world’s manufacturing. There are thousands of Guangdong companies actively doing business with the UK and many of which have potential in working with Thames Valley. Mr Chen of Guangdong CCPIT believes that there is much room for growth in the region for Guangdong companies and urges Thames Valley to strengthen its promotion and marketing activities in Guangdong. Guangdong has been chosen by the Chinese central government to set up Free Trade Areas in Cities of Guangzhou (Nansha), Shenzhen (Qianhai) and Zhuhai (Hengqin) which have been set up to pilot new policies (including lower tax bands) supporting the simplification of business set up and operation for overseas companies including British firms doing business in China. Many growing business sectors in Guangdong match well with those of sector strength in Thames Valley such as ICT, hi-tech engineering, automotive, education, etc. There are new opportunities in sectors undergoing further opening and reform such as finance, public services, health care and medicine, tourism, etc. This entry was posted in China market, Chinese investment, Chinese Inward delegations, Guangdong, Investment in China, Visit China, 广东 and tagged BCC LinkToChina, CCPIT, Chaozhou, Chinese investors, Foshan, Free Trade Areas, Guangdong, Guangdong Province, Guangzhou, Hengqin, Huawei, Hytera, Nansha, Qianhai, Shaoguan, Shenzhen, TPLink, Zhuhai, ZTE. Bookmark the permalink.